Brett Godfrey wast he CEO of Virgin Blue, who brought Australia an entire new concept in air travel, a low fare airline with that unmistakable Virgin flair and style. 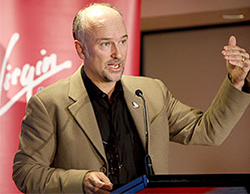 Brett’s Virgin career begin in the early 90’s when he moved to the UK to join the hugely successful airline Virgin Atlantic, the premium International carrier based in London, as Finance Manager. After three years in that role, Brett moved to Belgium and his next challenge when he was hand picked to represent Virgin’s interests in the acquisition of a new European low cost airline – Virgin Express. He was part of the team that took the airline public in 1997 and following that, was promoted to Chief Financial Officer. The 40-year-old former accountant hatched his plan for what is now Australia’s second national carrier while drinking pints with his fellow Virgin Blue founder, Rob Sherrard, in a West London pub during the 1993 Ashes Test series. At the time, Mr Godfrey was a junior finance manager at Virgin Atlantic. Godfrey’s bold play in 2000 to upset Qantas and Ansett’s stranglehold on Australian domestic airspace was one of the boldest challenges ever mounted in Australian commercial history. The airline launched on August 31 2000 with two aircraft and one route (Brisbane-Sydney). Virgin had a turnover of more than $1.7 billion within five years. By the end of his tenure in 2010, the brand had captured a 20 per cent share of the domestic market. He is still a board member of Canadian airline Westjet and Auckland Airport, in addition to Tourism Australia. He also has a number of commercial tourism interests, including luxury resorts Makepeace Island in Noosa and Quambi Estate in Tasmania which he owns in partnership with Virgin founder Richard Branson and Australian businessman Rob Sherrard respectively.